Why Is Career Planning So Important For You? Career planning might seem like a tedious process for many people. It is an extremely crucial but an overwhelming task that is often skipped by most people. But, it is also what distinguishes the successful people from the rest. As your career is an ongoing process, you will need to assess it on a continual basis. Career planning is the process of continuous reassessment your learning and development over time. It involves the concepts of strategic research, planning, and marketing to realize all your professional goals. Rightly said, Peter Drucker, the father of modern management. Everyone has dreams and wishes. Many of these dreams go unfulfilled as they seem unattainable. Let’s say, Shiva from Bangalore dreams of becoming a world famous CEO someday. But, it seems too ambitious and impossible for him at the moment. But, when he has a career plan, it makes his dreams seem achievable. It helps him assess his strengths, required skills, education or training needed and the deadline to achieve his goals. If Shiva is interested in higher studies abroad, then he will search for “GRE coaching in Bangalore near me” and select a GRE institute in Bangalore. He can enroll for the GRE coaching and get trained by highly experienced faculty. Career planning ensures that you are not leaving your life to mere chance but that you are taking control of your career journey. When you have a career plan in place, you will be motivated to take steps in the right direction. You will also take ownership of your life and be less likely to blame others/external things when things fail. Instead, you will reflect, learn from your failure, make the necessary corrections and get back on track. It’s very rare when someone finds their dream job just like that. Most successful people found their dream jobs after several years of planning and practice. A career plan is essential as it provides a roadmap for your future. It helps you make informed decisions about your career. Especially, when millennials are more than three times likely to change jobs than older generations, according to a recent Gallup poll. For example, Divya from Hyderabad has four years of work experience as an IT engineer and wants to get into a senior managerial position. One of the fastest ways to do so is to study at a reputed b-school. Divya has a solid career plan which includes higher studies. She searches for a GMAT institute in Hyderabad and enrolls for the GMAT coaching. In an uncertain business environment, your best bet to survive and thrive is by having a solid career plan in place. It helps you manoeuver the direction you need to take to stay on track of your career journey. 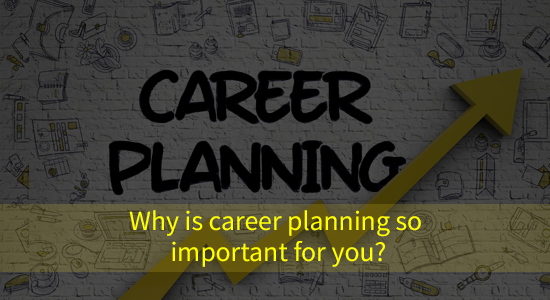 Career planning is the cornerstone of success in both your professional and personal life. It is what turns your dreams into reality. A good career plan is organically aligned with your core values and competencies. If you don’t have a clue where you are going in life, then chances are most likely that you will end up lost or in the wrong place. When you are not clear about your purpose or goal in life, you will find it harder to develop the self-confidence you need to take care of all the available opportunities around you. Without a clear goal or purpose, you will find it hard to resist following the herd and carve your path in life or gain skills that will make you a much-sought-after professional in the corporate world. On the contrary, when you have a solid career plan after crystal clear clarity of your goals, you will stay inspired and motivated all through the journey. Your success will lead to more success. Likewise, you will not be deterred by failure as your sights are on the final goals. Every milestone will accelerate your personal growth. At their very essence, plans are all about helping you to focus so that you can achieve your goals within a set time-frame. Envision where you want to be professionally in the next, for example, five years and set quarterly milestones to help guide you. Achieving milestones will give you a sense of accomplishment and will make you feel like you’re well on the way to reaching your final objectives. Career planning helps you to figure out your strengths, goals, make confident decisions, stay focused while saving your time and energy. The benefits of career planning are many including personal fulfillment, work-life balance, achievement, and financial security. Having a career plan helps you create your future the way you want it. You can plan your career effectively through an honest self-assessment, market research, and lifelong learning. If you need more assistance with career planning, you can contact our career experts for professional guidance. We would love to read your comments and know your thoughts. If you found this article useful, please like and share with your friends, and do follow our page to know when we post next. Thank you!